I'll guess the first half of the 1920's. Note that the "kimono" construction of these rompers is identical to that of house dresses of the period. I imagine that lots of these rompers were made from feed sack prints, particularly during the Great Depression. 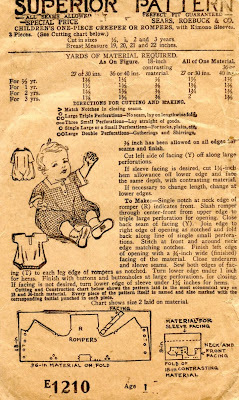 However, by 1937, Farmer's Bulletin 1778, Fabrics and Designs for Children's Clothes, a USDA publication, recommends solids in light blue, pink, green and yellow, but admits that small all-over designs can be used. This publication also recommends keeping the garment plain so that it can be ironed easily.